The Star Wars®: Edge of the Empire™ Beginner Game is a complete standalone experience for 3-5 novice roleplayers. In 1997, West End Games published the Star Wars Introductory Adventure Game. It was the best introduction to the Star Wars d6 RPG that the classic RPG could have been given, and indeed, it remains not only the best introduction to role playing in nearly forty years of the hobby, but also the standard by which all products designed to introduce players to the hobby are measured. 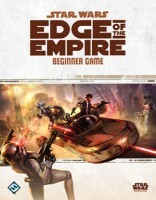 Now late in 2012, Fantasy Flight Games published Star Wars: Edge of the Empire – Beginner Game, the introduction to its forthcoming RPG, which is the first of three. It is designed for use by between three and five players, one of whom has to be the GM. It should be noted that this was not our first exposure to the Star Wars: Edge of the Empire Roleplaying Game in 2012. The publisher released a “beta” version of the core rules as part of a public play test effort. A full review of that is available to read here. What the Beginner Game does have, which the “beta” did not, is dice. Like the publisher’s version of Warhammer Fantasy Roleplay, this new game uses dice marked with icons appropriate to the setting of the game rather than just standard numbers. Of course, the box that Beginner Game comes in includes a whole lot more than just the dice. Open up the box and slide out the contents and they are revealed to be a “Read This First” pamphlet, the Adventure Book, a Map Sheet, four Character Folios, a sheet of counters, and the Rulebook. All presented in that specific order with everything being done in full colour on glossy paper and is pleasingly illustrated. The four-page “Read This First” pamphlet starts with a quick explanation of what a roleplaying game is before presenting a two-page example of play. It uses the four sample characters provided with the Beginner Game as they play through the first scene in the provided scenario. On the back is the introductory text for the scenario, done in the Star Wars classic opening text crawl. Sat underneath the “Read This First” pamphlet is a sheet advertising the forthcoming release of the Star Wars: Edge of the Empire Roleplaying Game and a link to the Fantasy Flight Games’ website for a scenario, “The Long Arm of the Hutt,” to be downloaded and played after the scenario in the Beginner Game. Extra support for the game also includes two more Character Folios that can be downloaded and used to add more players to the game. They consist of a Human Explorer and a Human technician. The meat of the Beginner Game starts with the Adventure Book, which is labelled, “Read This Second.” It properly introduces the Beginner Game and its contents, but is solely intended to be read and used by the GM. It is written to help him run between two and four players through the scenario, “Escape from Mos Shuuta.” Over the course of seven short encounters it guides the GM through how to run each of them, how to roll the dice and interpret their results, gives options that the player characters might take, and includes break point when the players gets to spend some of their hard earned Experience Points before the action continues. At each stage it introduces new aspects of the rules all laid out clearly so that the GM can find them as the adventure proceeds. Rounding out the Adventure Book are some tips and advice on being a good GM as well as some ideas for future adventures, both in Mos Shuuta and elsewhere. As written, “Escape from Mos Shuuta” is designed to be run as it is read. To that end, the scenario structure is kept linear and simple. The GM is even advised to tell his players that they might have missed some clues if they have their characters step ahead of an encounter. As read, it does a good job of presenting the GM with the information that he needs at the right time. Even so, it would probably be worth the prospective GM reading through the Adventure Book in order to be better prepared. An experienced GM will probably have no difficulty in running “Escape from Mos Shuuta” as written. The A3-sized Map Sheet is double-sided. On the one side is the deck plans of the Krayt Fang, a YT-1300 Light Freighter and the docking bay where the player characters find it in the scenario. On the other side is a map of Mos Shuuta, the setting for the scenario; plus plans of a cantina and the spaceport control, both locations in Mos Shuuta. Rounding out the Beginner Box is the Rulebook, which is marked “Read This Book Last.” Expanding upon the rules presented in the Adventure Book, the Rulebook covers all of the action presented in “Escape from Mos Shuuta” and more. Besides all of the extra detail and explanation, it adds support with more gear and equipment, starships and vehicles, and adversaries. So how do the rules work in the Star Wars: Edge of the Empire Roleplaying Game? Essentially it uses a dice pool mechanic with a player required to assemble a pool drawn from the RPG’s six dice types. The eight-sided Ability dice, the twelve-sided Proficiency dice, and the six-sided Boost dice are positive dice, whilst the eight-sided Difficulty dice, the twelve-sided Challenge dice, and the six-sided Setback dice are negative dice. The Ability dice represent a character’s base skill or aptitude, the Proficiency dice his innate ability and training, whilst Boost dice are benefits granted from the situation. The Difficulty dice represent the task’s inherent complexity, the Challenge dice more extreme adversity; and Setback dice obstacles that come from the situation. The positive dice are marked with Success, Advantage, and Triumph symbols, all of which a player wants to roll, as opposed to the Failure, Threat, and Despair symbols on the negative dice, which he does not. When rolled, the opposing symbols on the dice cancel each other out, but a player only needs to roll a single Success to succeed at a task. At its heart though, the dice mechanic in Star Wars: Edge of the Empire is orientated towards a narrative outcome rather than a simple binary yes/no outcome. Thus the symbols rolled will actually tell the story of the outcome. For example, a character might roll a simple number of Successes; no Successes, but an Advantage or two; or a number of Failures and several Triumphs; and so on. How these outcomes are interpreted perhaps represents the most challenging aspect of the game, especially for those players new to roleplaying. 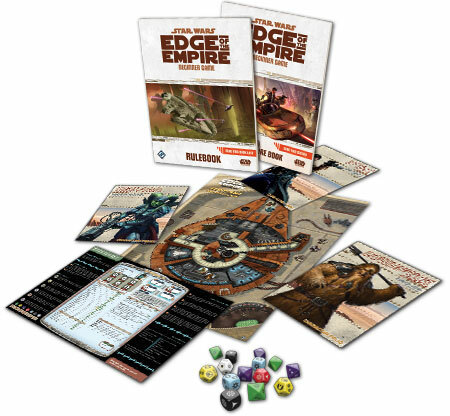 The Star Wars: Edge of the Empire – Beginner Game comes with fourteen dice. These consist of three Ability dice, two Proficiency dice, two Boost dice, three Difficulty dice, a single Challenge die, and two Setback dice. The last and fourteenth die is the twelve-sided Force die. This is solely used to generate Destiny Points in the Beginner Game, which both the players and the GM can spend to upgrade the dice types in their pools. An Ability die to a Proficiency die for a player character, a Difficulty die to a Challenge die for the GM’s NPCs. Destiny Points do a lot more in the Star Wars: Edge of the Empire Roleplaying Game, but common to both the full roleplaying game and the Beginner Game, Destiny Points have a dark side and a light side. The player characters use the light side, whilst the GM uses the dark side, and cleverly, when a Destiny Point is used by one side, it flips so that it can be used by the other side. Thus, when a player uses a light side Destiny Point, it switches to a dark side that only the GM can use. Several Destiny Points are included as counters in the Beginner Game. There is no doubt that the Star Wars: Edge of the Empire – Beginner Game comes nicely appointed. It is also written and overall, a pleasing package. For the experienced roleplayer or GM, it is easy to open up a copy of the Beginner Game and get playing after a relatively short period of preparation. It will be even easier if the GM has read the Rulebook that comes with the Beginner Game, or indeed read either the Star Wars: Edge of the Empire Roleplaying Game beta or the forthcoming full version of the Star Wars: Edge of the Empire Roleplaying Game. It is not though, as well an appointed introduction to roleplaying Star Wars as was West End Games’ Star Wars Introductory Adventure Game. That was as much a utility package as it was an introduction and to that end included more adventures, more support, and more hand outs. Times change though, and so production values, for the production values in the Star Wars: Edge of the Empire – Beginner Game are much higher, with better art and a stronger themed layout. Yet whilst it appears to include everything that a GM and his players needs to play, there are two issues with the Beginner Game. The first is minor; the second is more of an issue. The first is that it feels concise, as if it could have included something more. The emptiness of the box that the Beginner Game comes in only contributes to that feeling, and perhaps the inclusion of a second scenario would gone some way to negating this feeling. The second is an issue for the player coming to the Beginner Game for the first time. He is just not quite as well served as the GM. Other introductory boxed sets for other RPGs, including the one for the d6 Star Wars, have provided a player with a means of learning the rules and the mechanics, usually some kind of solo adventure. Now each Character Folio does include an explanation of the dice symbols and it does indicate which types of dice have to be rolled with each skill check, but it does not explain how a dice pool is rolled and how its results are interpreted. This is perhaps the biggest omission in Star Wars: Edge of the Empire – Beginner Game. Despite this omission, the Star Wars: Edge of the Empire – Beginner Game is everything that a prospective Star Wars roleplayer would want. It includes the rules, an adventure, characters, maps to play on, and perhaps most importantly of all, the dice! Not just a solid introduction to the Star Wars: Edge of the Empire Roleplaying Game, but a good introduction to the roleplaying hobby too. This review will be about Star Wars®: Edge of the Empire as a whole, not just the beginner game. The beginning game is a nice package with all the components you need to get started. You also get a couple of maps for the first adventure and you can dl additional stuff after the first adventure. When you finally spread your wings go explore the outer rim, you wont be disappointed. Fun classes and lots of great info in the core book. What i like about the game is that its more ruff since its about the outer rim and not the core worlds. Everything is a bit more dirty, more law less. You cant f.ex play as a jedi, but you may play as a force sensitive character, witch also keeps the game more balanced. I highly recommend this game for anyone that wants to get into RPG games and love Star Wars. Add a Review for "Star Wars: Edge of the Empire Beginner Game"